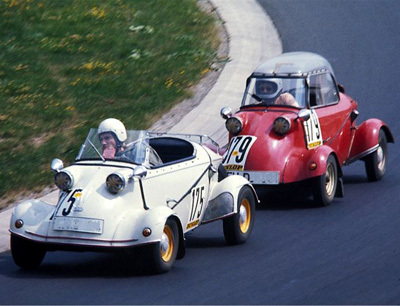 The Messerschmitt Tg500, or as it is more popularly known, the Messerschmitt Tiger was first seen at the 1957 Frankfurt Motorshow. The Tg500 went into production in 1958 with a convertible version offered in 1959. The Tg500 is powered by a 493 cc two cylinder, two stroke Sachs engine capable of taking the microcar up to 85 mph. The Tiger is one of the most recognisable and popular microcars of all time, the aircraft-canopy style glass merely adds to the overall quirkyness of the vehicle.